Lord Krishna was born in Mathura. Every year, Mathura witnesses extravagant celebrations for Janmashtami. Know more about Janmashtami in Mathura. Krishna Janmashtami (Lord Krishna's birthday) is celebrated with pomp and merriment all over the world. One of the most prominent Hindu festivals, Janmashtami celebrates the birth of Krishna and also marks the classic tale of good over evil. Mathura, located in North India, celebrates Janmashtami with effervescent fervor and splendor. It is said that the celebrations in Mathura for the festival of Janmashtami are unparalleled when compared to the celebrations elsewhere. The city of Mathura, adorns a festive look and the every being is steeped with devotional passion during Janmashtami. It is however, important to recount the tale of how it all began, before divulging into the festivities in Mathura. Lord Krishna was born in the month of Shravan to King Vasudev and Devaki. Kamsa, Devaki's evil brother, was warned by a divine voice, that the eighth child born to the couple would defeat and kill him for his bad deeds. On hearing this, Kamsa locked the couple in a dungeon, pledging to kill all the children born to the duo. However, the seventh child miraculously got transferred to Rohini's womb who was Vasudeva's second wife. 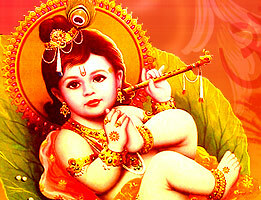 This child was born as 'Balram'; Lord Krishna's friend and brother. When Lord Krishna was born, King Vasudev, in order to save his son, exchanged him with Yashoda's daughter in Gokul, while the whole town was asleep. Thus, Krishna was safe from the talons of the brutal Mathura King, and the baby girl vanished into thin after air giving Kamsa a second warning saying "The one destined to kill you is safely away at Gokul". Every year, the main celebrations of Janmashtami take place at the Janma Bhoomi Mandir at Mathura. History states, that this was the place where Krishna was born. Every household in Mathura celebrates Janmashtami with an idol of Krishna placed on a pedestal, with long fasts and the chanting of 'Shlokas'. 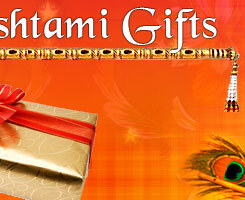 Songs and hymns are also sung in the glory of Lord Krishna's birth. Traditionally, Rasleelas (dance dramas), midnight celebrations, fireworks and Jhulotsav (the cradling ceremony of Lord Krishna) are synonymous with the festivities of Janmashtami. Mathura celebrates Janmashtami with a month-long feature known as the 'Ghatas'. The festival would be incomplete without this feature. The color of the walls, the theme and even Lord Krishna's clothes are of the same color. This changes every year and the devotees engage themselves in fervent passion to adorn temples, and their homes with beautiful decorations. If you are missing out on the Janmashtami festivities this year, do not worry. All you have to do is log on to our website and choose from a wide variety of sweets and flowers to send to your loved ones all over the world, for cheap! What better way to be a part of the celebrations, than gifting those special people in your life, unique Janmashtami gifts that they will cherish forever? Now you can 'up' the festive quotient by sending them the choicest gifts ranging from dry fruits to flower bouquets for dirt-cheap prices!